The HTL-L Series accepts 115 or 230 VAC and runs a 12 or 24 VDC motor. The drive is rated for 5 Amps continuously, or 7.5 Amps peak. The HTL05-D-4Q-L is similar to the popular HTL05-D-4Q except that the -L suffix adds a linear feedback feature to the drive. This feature is designed for positioning applications. The feedback signal can come from a potentiometer, as in the case with linear actuators with a built-in pot. The feedback signal can also come from a analog voltage signal from a sensor. The drive has field adjustable proportional gain to fine tune the system for a variety of motors. 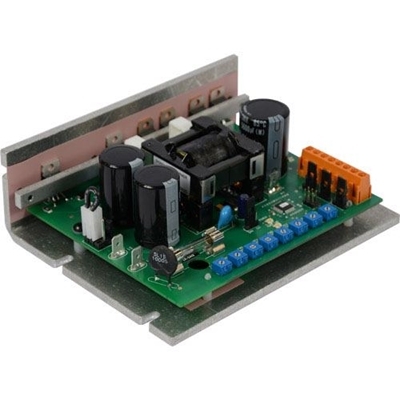 The HTL05-D-4Q-L is a great choice for a positioning application with a low voltage motor.